Technology has always been there to convenience mankind and as we go further and further in the future, we always get more and more innovation that helps make our lives easier and save on time and money. MAS too had that in mind of it's passengers and to make their lives easier and convenient for them, they launched a mobile website called flymas.mobi. So what exactly can you do with this portal? It's a great way to conveniently plan up your travel from anywhere and anytime (provided your mobile device has reception, of course) where you get to book your flights, check-in and choose your seat and check out great deals and also summoning up your flight information on flights you have booked. Here's a look at the main menu on a mobile device. If there's none, I'd recommend to proceed to the "Timetable" area to check out available flights to the destination you want to go. Choose your location of departure and your destination and choose the day you want to depart from. 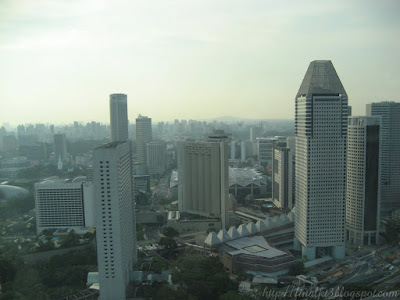 There are 30 Locations in Malaysia and 42 Locations Internationally at the time of this writing. Once you call up the necessary information you'll see that there's a book flight shortcut at the bottom of the information, conveniently placed should you decide to book flights to that destination. At the book flight screen, it even tells you how far/near you are in completing your flight booking. There are five pages to completion. On the 2nd page, it even tells you which flight is sold out to avoid any overbookings. At the 3rd page of the flight booking, you can either choose to purchase it there and then or hold the ticket. Fill in your particulars on page 4 and that's it! You're good to go! An e-mail and SMS will be sent out to you for booking confirmation. Take note that if you choose to hold a ticket, it will only be held for 8 hours without payment, after which, you will require to contact 1 300 88 3000 (within Malaysia) or +603 7843 3000 (international) or your nearest MAS office to complete the booking. After booking, you will find a summary of your flights booked under the "My Booking" area. Just key in your booking number and last name to retrieve the details of that particular flight. You can even check in through this portal and it's either by e-ticket number or booking reference (available only for single passenger booking). There's even a "flight status" so if you're planning on picking up somebody from the airport, you can see whether the flight has been delayed or not. This certainly makes life easier. One other feature that caught my attention would be the baggage tracer. Should your baggage be delayed or missing, after reporting, you can check the status of your missing case at this place. May this unfortunate incident never happen to you. Kudos to MAS for being able to mobilized booking their flights now. This is really a good move and would certainly make things easier and more convenient for the frequent travelers. Tried the Damansara Utama (known as uptown) Hon Kee Porridge outlet today which was organized by this food blogger name FeeQ. It has this cute logo with an auntie smiling at you. Although this shop outlet that I visited is quite new, yet there is quite a history to it. The original shop was set up in Petaling Street at KL during 1949 as you can see in the logo and now, 60 years later, the 3rd generation carried on their family's recipe in bringing the same kind of deliciousness to it's porridge. 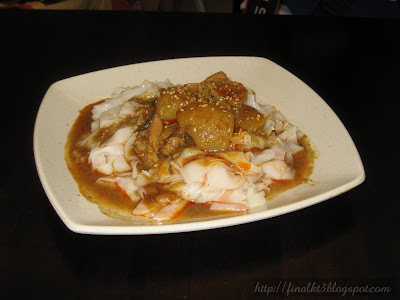 I simply adore this Chee Cheong Fun with Pork Curry. 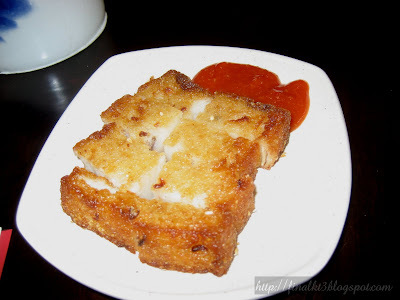 I can't remember tasting such delicious Chee Cheong Fun during my time in KL/PJ. 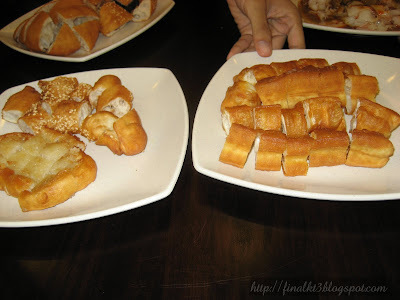 This makes me miss the old days of eating delicious Chee Cheong Fun back when I was still living in Ipoh. The seller would come around in a trishaw and I've got to say, it was truly a magnificent dish from a person peddling by cycling a trishaw around! Still, I would say this is one of the most delicious curry chee cheong fun I've tasted. 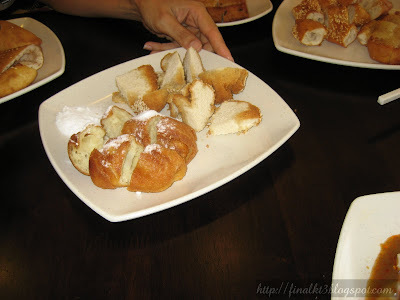 Also along with this, we grabbed some Chinese pastries to try out as well. Here's some ham chim peng with one being plain while the other has red bean filling in it. 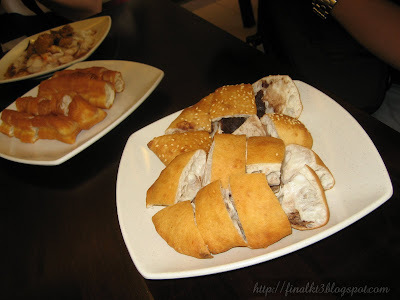 On the left, there are some ma kiok with kap jung at the bottom (kap jung is like ham chim peng but with glutinous rice as filling in the middle) while the yau char kuey is being stolen away by some hungry fellow. Oi, wait till I've grabbed some lah. 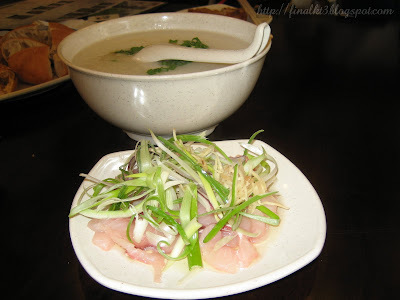 A shot of the loh bak kou. The one that has the powdery sugar substance on top is called sa yung while the other Chinese pastry is called siew hou jou. See how hungry those people are. They fast fast transport it over to their side to munch on these. By the way, these Chinese pastries are from the Kong Har Siu Hou Jou which also originates from Petaling Street since 1953. And now it's also available in this Hon Kee Porridge establishment Uptown outlet. 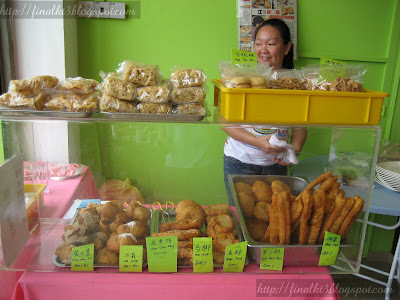 See how happy the auntie was when we were gobbling up her famous Chinese pastries. 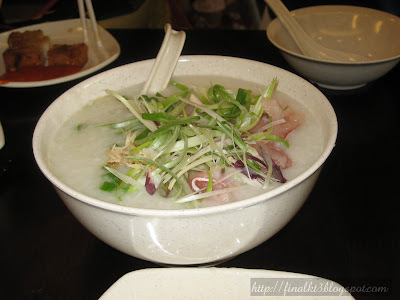 And for the main course, we opted for the Porridge with raw fish which is what Hon Kee porridge is famous for. 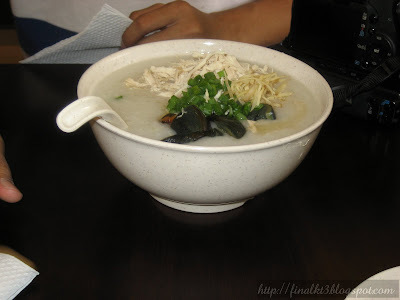 Another porridge that we tried was a combination of Century Eggs and shredded chicken together. 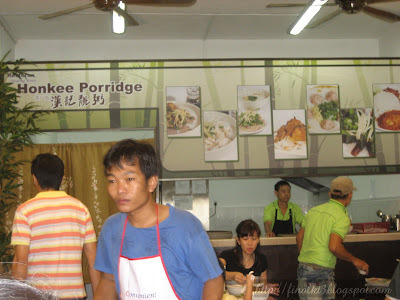 Besides this Uptown outlet and the Petaling Street outlet, Hon Kee Porridge also has one outlet at Lot 10, Hutong. The concept over there is food court style. There contains many other food stalls as well. As for this Uptown outlet, it's opened from 7am till 10pm daily. Same row as the TMPoint Uptown branch behind the Starbucks row. 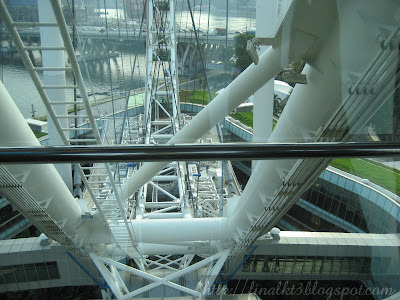 With the conclusion of learning to shape a pewter, we then headed on down to the Singapore Flyer. 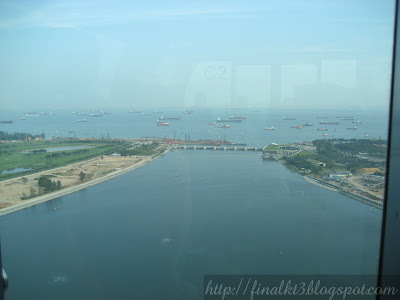 I must say taking a ride on the Singapore Flyer was really a breathtaking experience. First time I sit in a "Ferris-wheel" that I can walk in! 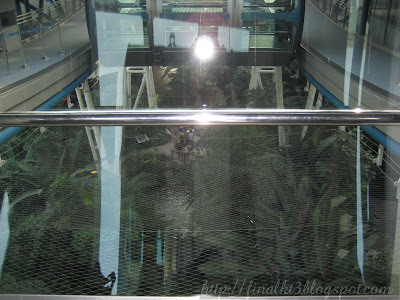 They term taking a ride in the Singapore Flyer as a flight because you're like flying to the sky but in a circle though. And the flight duration of 1 full circle is approximately 30 minutes, just like a airplane flight from Malaysia to Singapore. The view was simply breathtaking, so I'll let the pictures do the talking. 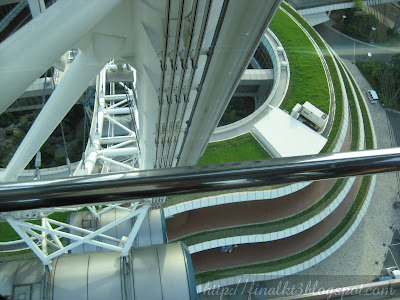 Some facts about the Singapore flyer, the diameter of the Wheel, the whole big thing from one end to the other is around 150 metres while the height of it is around 165 metres which is equivalent to a 42-story building. Another angle of the city view. 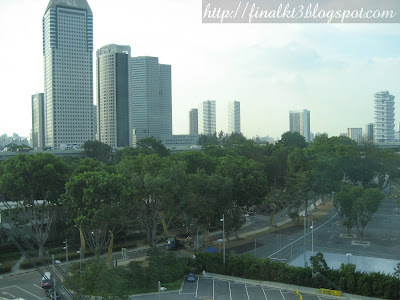 I spot Pan Pacific Hotel~ that's where I was the night before the Singapore Flyer flight for the Nuffnang Asia Pacific Blog Awards 2009. The support wheel of the carriage. Looks like there's a lot of people flooding towards the ferry area. Must be an event going on. A view of the vast blue sea. Last minute shots before departure. 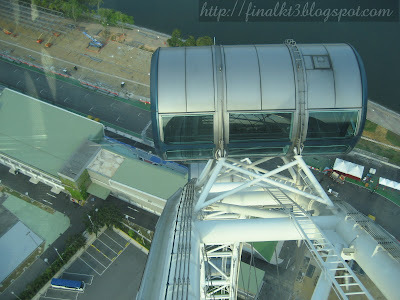 The capsules (carriages or compartment area of the wheel) are each fully air conditioned and has UV-protection. It can take up to 28 person and there are 28 capsules. 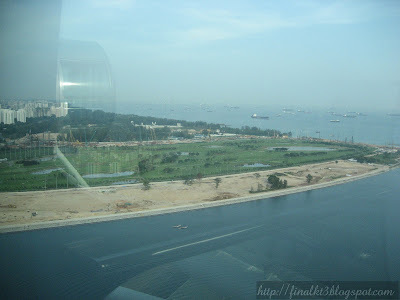 It was mentioned that at the peak you can see some parts of Malaysia and Indonesia as well. 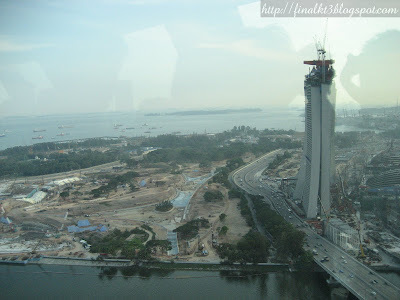 Hmmm....looks like this part of Singapore is still under construction. 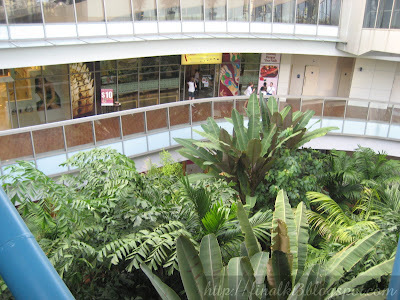 After the ride on Singapore flyer, I decided to have a look at the nature in the building. It's called the Yakult Rainforest Discovery. An aerial view of it. See the pool of water in the middle? 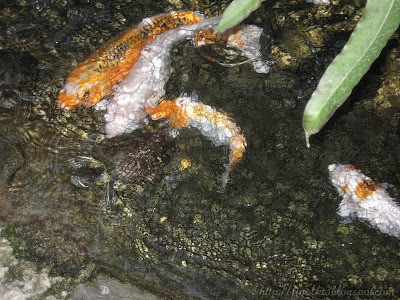 It's actually a pond filled with Kois. 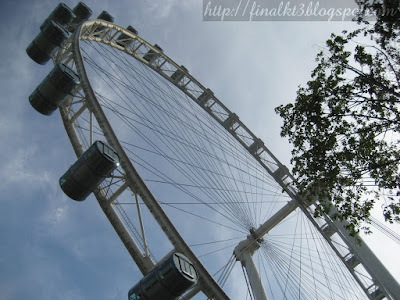 The Singapore Flyer is open daily from 8.30am till 10.30pm where the last phase of boarding would be at 10pm. 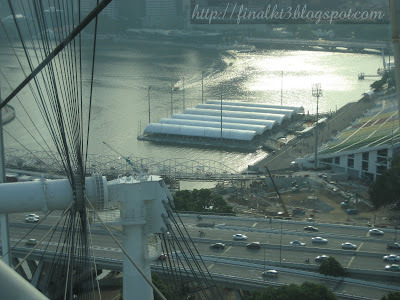 The MRT is Marina Bay I guess or the Promenade MRT once it's completed. 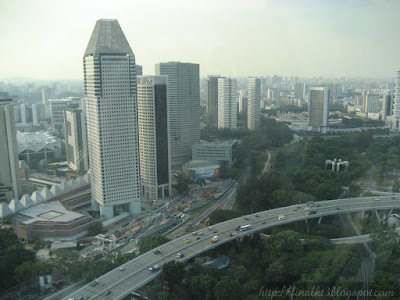 But from the City Hall MRT, there's a shuttle bus that takes you to Singapore Flyer. The bus will be at the bus stop between St. Andrew's Cathedral and the Adelphi along Coleman Street. 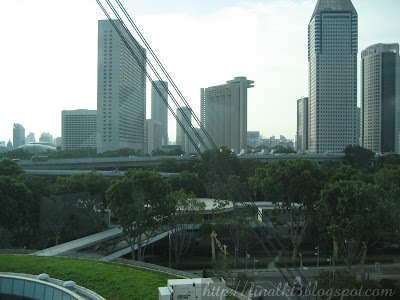 One other place the shuttle bus goes too would be at Suntec City. It'll pass along outside the convention center. For the City Hall shuttle service, it'll be from 10am - 10pm, 30 minutes intervals. But for the Suntec City, the operation time will be from 11.30am - 2pm and 5pm - 7pm with 30 minutes interval. 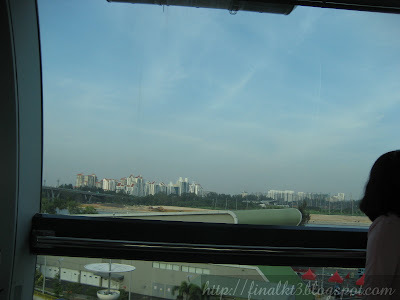 Now that I have seen the daytime view on the Singapore Flyer, next time I should try the night view. I'm changing the title of A Japanese word a day to a more appropriate title which is 7 Japanese Words A Week. This would fit what I've been doing which is posting 7 Japanese words to learn per week rather than A Japanese word a day. This week, since Christmas is around the corner, let's get some words related to it! 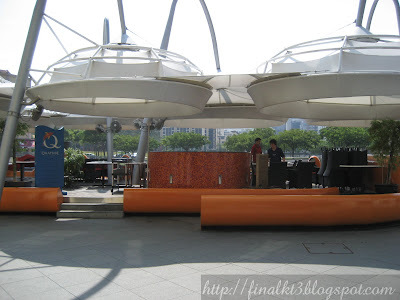 When we were done touring with the Mint Museum of Toys and Singapore Raffles Hotel, we headed down to Clarke Quay. 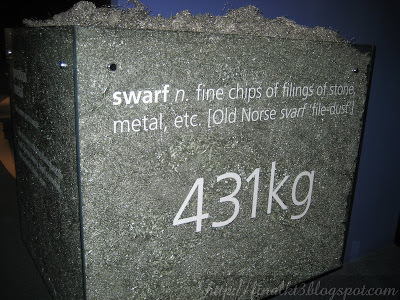 More specifically, we went to the Singapore Royal Selangor Pewter Centre. The surrounding area around seems to be a nice, cool, calm ambiance. Here's what interest me and my mom, which we'll definitely try out the next time. Hmm.....it seems, I don't have a picture of the riverside. 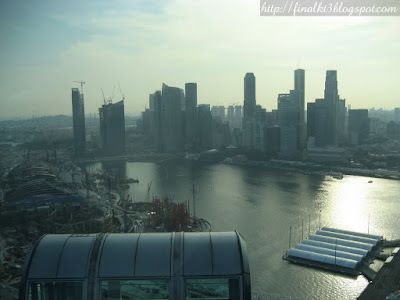 Over there, there's one of the many riverside cruise available all over Singapore. Anyway, back to the Royal Selangor Pewter, as you enter the centre, you'll be in the retail showroom which is of course free admission. There's a guided tour available for S$2 which takes you to The Pewter Gallery, Pewtersmithing Demonstration and of course, the Retail Floor. 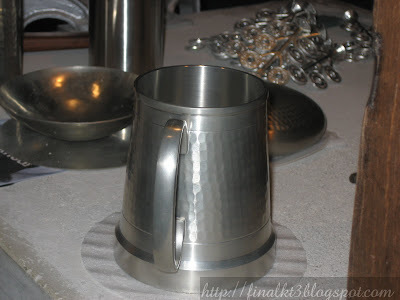 And so, onwards I went on the pewtersmithing demonstration. They pour the pewter into this contraption and push it and when it's cooled (in matter of seconds) it'll form the shape of a money tree. 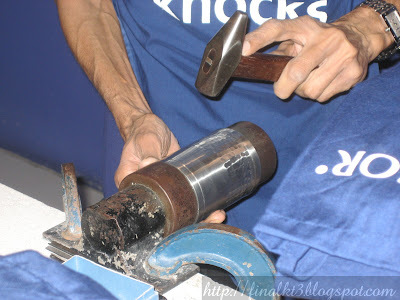 But what I find is the most interesting thing about this place is "The School Of Hard Knocks"!!! It's where you'll be guided on shaping a flat piece of pewter disc into a personalised pewter dish. 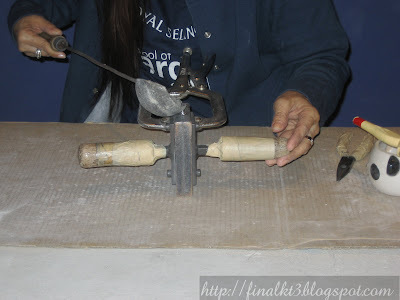 The tools you'll be using would be a block of wood with two types of holes on it to shape the disc into a dish, a mallet where you'll knock the disc into shape and some nails that contains alphabets and numbers on them so that you can use those to make shapes or to put engrave a message into your pewter dish. At the end of it all, you'll get a certificate for that! 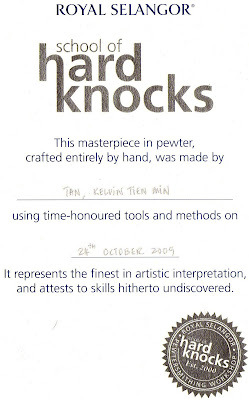 The School of Hard Knocks is usually conducted in groups of 12 people in one session and cost S$30 per person. The Royal Selangor Pewter Centre at 3A, River Valley Road, #01-01, Clarke Quay, Singapore 179020 is open daily from 9am till 9pm. 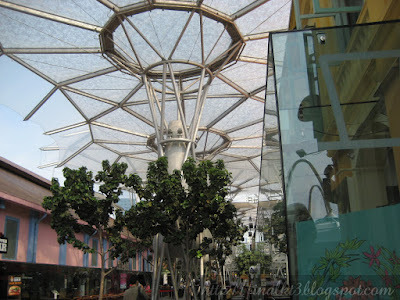 The nearest MRT station would of course be Clarke Quay.